I’ve been designing a cooperative game for a while now, and it occurred to me–particularly after discovering a podcast entirely focused on cooperative games–that I should make a Top 10 list specifically for this genre of games. By “cooperative game,” I’m referring to any game where all players are working together to win or lose. One-versus-many games and team games don’t count, nor did I include semi-cooperative games (where it’s possible for some players to win and not others), though I did consider cooperative games with traitors. 10. Shadows Over Camelot: I love the theme of this one. It’s the only game on the list with a traitor mechanism (I actually think it may have been the first game ever to have a traitor mechanism). 9. The Captain Is Dead: I’ve only played this once, but I had so much fun with the theme and the tension of surviving on a spaceship. 8. Pandemic Legacy: I’m often hesitant to put campaign games on lists like these, as my main filter is, “What would I rather play today?” But Pandemic Legacy had a big impact on me as a designer, and I really admire the design choices in the sequel. 7. Legendary Encounters Alien: This is a game that completely surprised me by how much fun it is. I love how it lets you help other players and the sense of dread it creates by not letting you see creatures that are sneaking up on you. 6. Harry Potter Hogwarts Battle: I love cooperative games where you play, lose, and immediately want to play again. In fact, I don’t think I’ve ever played a game of this where I didn’t immediately play again. I’ve also never won. 🙂 I’ve only played Game 7, but I like that you could start at Game 1 and ramp up in complexity. 5. Burgle Bros: I love heist movies, and this game perfectly captures that theme. I prefer playing the 2-level version. 4. Forbidden Desert: This was a really tight call compared to Burgle Bros, as they have a number of similarities. I really like the satisfaction of clearing sand off tiles so you can move through them. 3. 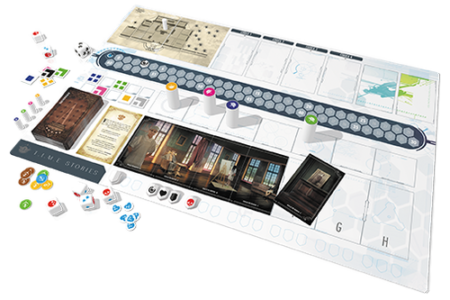 Mysterium: This is such a brilliant concept: One player is a ghost, and they’re trying to use visuals (cards) to convey to the other players how they were killed. Kind of morbid, but it’s a delightful game that is super easy to teach and return to. 2. Flip Ships: A dexterity challenge seems like the perfect fit for a cooperative game, as it gives even the most skilled players the chance to horribly (and memorably) fail and even the newest players a chance to have epic moments. TIME Stories: As my current favorite game in any genre, this should come as no surprise. I flat-out love TIME Stories, as each scenario feels like a mix of a movie and an instant memory. What are your favorite cooperative games? This entry was posted on Thursday, April 12th, 2018 at 8:04 pm	and is filed under favorites and tagged with board game, favorites. You can follow any responses to this entry through the RSS 2.0 feed. TIME Stories, like you. 🙂 I have a soft spot for several on your list, plus others like Ghost Stories are pretty high for me. Recently I’ve tried a great newer one called Unicornus Knights. I haven’t heard of Unicornus Knights, but I looked at it on BGG, and it looks pretty cool. What do you like about it? They’ve done an excellent job capturing both a feeling of cooperation as well as players getting to make individual decisions. And the theme is amusing and fun. Wow! nice list Jamey! I really love Forbidden Desert myself! My group loves Kitchen Rush From Artipia Games, where as a group you try to make as much receipes as possible as your workers are sand timers. it’s a very tight and fun game and it reminded me of a PC game on steam called Overcooked. Nice! A friend in my gaming group has Kitchen Rush–I need to try it. Gloomhaven wasn’t included because I just didn’t have that much fun with it the 6 or so times I played it. It’s a very well-designed tactical combat game, but I’m not into tactical combat games. I was simply alluding to your guest contribution to Gloomhaven as a scenario creator, so wasn’t sure if GH wasn’t listed on account of that. Good to know, thanks! Not going for an ordered list here, but here are some that I like. Caveat: I’m not that big on cooperative games anymore (since I’ve played them so many times with Mira) so the games listed here are the ones that I’d even still be interested in playing and suggest. All three of these treat sensitive subjects very delicately, and I love the way they make you think about the “real world repercussions” of your actions. I love the frantic nature of these and how they are pretty short so don’t outlive their welcome. I love the theme on both of these and how they take “Pandemic-y” mechanisms and make them feel fresh. I’m not usually into horror, but this feels mystery enough for me to really enjoy playing. The fun of Orleans but cooperative. So good. I just got 7th Continent in the mail and am also looking forward to when I get my copy of U-Boot. I’m happy that co-ops are feeling fresh again, despite my having played a bunch and kind of cooled on them. Oo…I totally forgot about Orleans: Invasion. That was a mistake, as I love that. I’m going to edit the post. I really need to try Freedom! Hey Jaam-what’s your recommendation for the best 2-player cooperative game…ideally one that takes less than 1.5 hours to complete. Thanks! That’s a good question. Others may have better answers, as I rarely play games against only 1 other player. I think the Harry Potter game would work well with 2, as would Forbidden Desert. The Game is very easy to learn, and I’ve played it with 2 and had fun with it. Patchwork, Hanamikoji, 7 Wonders Duel, The Rose King, and The Hive. These are short and easy to learn. Ooops!! These are fun cooperative games. Hanabi (Complete card sets), The Game (Complete card sets), Legendary Encounters: An Alien Deck Building Game (Help each other to survive and not become Alien), Burgle Bros. (People steal together, stay together), Unlock! Squeek & Sausage (Escape room in a box!) and Healthy Heart Hospital (Try not to have patients die on you). I heard Codenames duet (Give one word to each other to find all your agents together before time runs out) is also good. I am also a huge fan of Hogwarts. In my house we have implemented two house rules that have drastically improved our enjoyment. 1) You are permitted to discard one card from your hand permanently on your turn. Honestly, I think the exclusion of this mechanic was an oversight, as you are overburdened with useless cards for at least the first half of every game. Seems to introduce an artificial difficulty that saps some of the fun. 2) We don’t randomize the enemies, we play them roughly in the order of the films. Seriously, taking on the Basilisk or Voldemort as your first battle is not only devastating to the team, it’s also out of joint with the theme. You start with some pretty sad abilities, so it’s absurd to be forced to take on final bosses out of the gate. Anyway, my pair of pennies. Thanks for the co-op recommendations! I see it there in the Honorable Mentions. Probably #19. That’s not too bad. In terms of the overall experience, it’s definitely around 11 or 12. It isn’t one I think I’d play again, just because we played it so much during the campaign, but I really enjoyed the campaign.